Here’s an image I took with my NexStar 6SE and Canon EOS Digital Rebel XT DSLR of the total lunar eclipse on the evening of 27 Sept 2015, just after the eclipse reached totality. 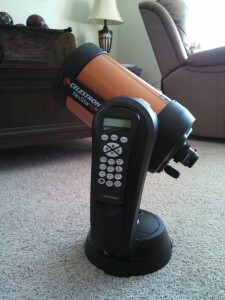 The image was taken with the DSLR mounted at the prime focus of the NexStar 6SE. This is a 1500-mm f/10 setup, with the camera set at ISO 400, 15-sec exposure. Unfortunately, with the long focal length I couldn’t quite fit the entire moon in the frame. 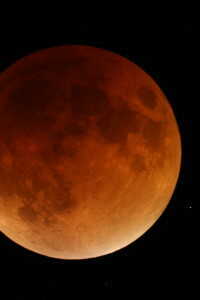 Total lunar eclipse image taken with Canon EOS Digital Rebel XT connected to Celestron NexStar 6SE at prime focus. 1500 mm f/10, ISO 400, 15-sec exposure. I seem to be getting into the habit of acquiring older gear and then facing the uphill battle of making it work with more modern equipment. Recently, I wandered into the local pawn shop here in Woodland Park and discovered a used Canon EOS Digital Rebel XT (350D) DSLR camera sitting on the shelf. I’d always wanted a DSLR with which to try some astro-imaging but wasn’t willing to shell out the bucks for a new one. So, I laid out the cash and took the 350D home with me to check it out. Did I mention that we moved from Colorado Springs to Woodland Park this spring? We found ourselves a nice house on an acre with mostly dark skies overhead. You can actually see the Milky Way on moonless nights–completely unlike the washed out urban sky in Colorado Springs. We love it! If you noticed that there haven’t been any additions to the ol’ web site for more than a year, now you know why. It’s a lot of work to get one house ready for sale, sell it, find a new house, buy it, and get moved. I’m pooped. Anyway, let me tell you a little bit about the new camera and what it took to get things up and running. Did I mention that I just received my new Elecraft KX3 (#5522) ham transceiver? Wonderful rig (but more on that in another post). The KX3 ships with your choice of a USB cable or a serial cable for interfacing with your PC. With either of these cables, you can use Elecraft’s KX3 Utility software to update the KX3’s firmware, or you can otherwise control the rig with suitable software (say, Ham Radio Deluxe) running on your PC. At any rate, I received the USB cable with my KX3. I’m interested to see if I can rig up a bluetooth connection between my KX3 and my Android tablet, though, and it seemed that a good place to start would be to fabricate a serial cable, to which I could ultimately connect a serial-to-bluetooth adapter of some sort. Here’s how I did it.